There’s a job on my To Do list I’ve been putting off for a long time. One I hate, loathe and detest. One that no woman should ever have to deal with alone. One that goes far beyond the call of duty for a designer. There comes a time when they start to take over. I’ve only lived here two years, so apart from a few (really not that many) I moved house with, these are all newly arrived. In an attempt to lessen the agony of the looming stacks, I tried depositing them in the bathroom but found I was swiftly rationed to only one at a time. The same on the kitchen table and under the sitting room coffee table. This is what happens when you live with other people. So they are in my bedroom. Beside the bed, beside the sofa. On the sofa. Sometimes on the bed. On the desk, on the floor, on the shelves (already full). Other people hide them under their beds, hidden from their loved ones who simply don’t understand. Under the bed is already full, so that wont do. I have shelves, but following a studio shelf disaster, shelving has become an issue. Either the magazines go, or the yarn goes. Or even worse, the SHOES go. no no no. So the magazines go. 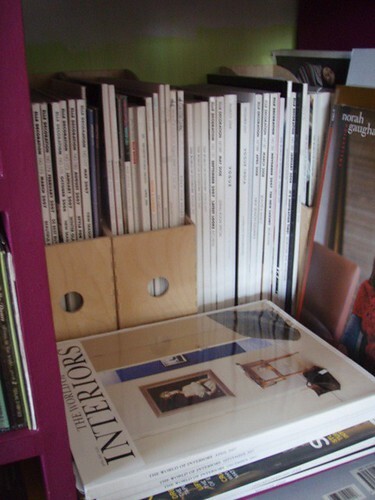 I am slowly going through two-years worth of Elle Decoration and pulling out the bits I want to keep. This is surprisingly few pages, so I am doubly glad I canceled my subscription, in a fit of credit-crunch panic. I miss it, but by saving the subscription money I can buy more yarn. Or even more shoes if I keep saving. World of Interiors I miss even more. Much more. Much, much more. So I wont be getting rid of any of those just yet. They will stay, hidden, on my bookshelves. Crafts and Craftzine both have a few issues left to come on the subscriptions this year, so I am not without pictures through the post just yet. But their time will come, alas. Selvedge continues though. I’m not ready to part with that yet, having been there from the very start. I love it and hate it in equal measure. That gets delivered to the studio, so I’m thinking it might make a permanent home there, if I can face shifting the back catalogue. Hurrah for the out of date magazine man on the market though. He ensures I come home with a random selection of mags I wouldn’t normally buy for not many pennies at all. And for the Country Living I take out of the recycling box. I’m not ready to even think about the 4 foot high stack at the studio yet… they don’t really count, do they? What about making christmas trees out of them and giving them as cheap christmas presents?!? have you seen the tutorial on One Crafty Mumma? Could that work? You could even spray paint them and dip the spins in glitter to remove the element of magazine-ness… Or use as wrapping paper? How eco are we feeling? On that note, we have about 40 old blue and green tshirts here with your name on them – I thought you could think of something eco to do with them?! With regard to the storing of magazines under the bed: I had two teenage daughters, and I found that this storage strategy was only a problem when the legs of the bed ceased to reach all the way to the floor. 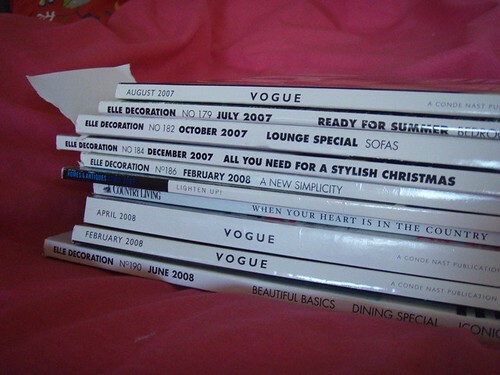 According to all the interior design mags I have stacked in my living room, it is very, very chic to use books as coffee tables. Maybe you could use the mags as night stands? Since they are already beside your bed? I agree with Selvegde . Why is do you love/hate it?